At The Fine Diner Bistro we challenge tradition. With our menu, our team, and our initiatives, we do things differently! Can't wait for you to join us! Our Philosophy on Gratuities is more the merrier!!! Not because we are greedy but because we want to be able to give back to our community. When you give a gratuity to our team, 30% is donated to our Not-For-Profit Partners, 50% stays with your outstanding server and 20% is shared to the Creative Culinary Team. Together, we have an opportunity to make an impact in our community, one dish at a time. To see all of the not-for-profits we support, click here. We operate on a nearly waste free system. From our thorough recycling program, biofuel conversion, compost collection and perishable redistribution partnership with LeftOvers Calgary, we are very proud of how little waste we generate! All of our suppliers are carefully selected to ensure a high-quality, community-sourced products. We support ethically sourced products as much as possible for guaranteed freshness and taste! Our menu is inspired with in-house creations; our creative dressings, creamy roasted garlic hollandaise, famous Candied Bacon and everything in between! Our dedication to community suppliers and sustainable business practice has paved the way for us to be recognized as both a community-focused and community-sourced restaurant. We are dedicated to serving the business, leisure and lifestyle needs of Calgary. Chef Szostak is a recognized restaurateur with more than 20 years of chef, management and hospitality industry experience. His passion revolves around supporting a movement focused on building sustainable businesses, committed to showcasing both new and traditional culinary techniques that uses community sourced and ethically raised products. As a proud man of faith, and recognized ambassador for community service, Chef Szostak is most comfortable surrounded by those who share his love for food and people. Please email your resume to info@finedinerbistro.ca. Do you need a private room to host your next business meeting, brainstorm session or special occasion? The Fine Diner Bistro offers a secluded, fully equipped, centrally located space for your next business gathering. Get the benefit of amazing hospitality, without the interruptions, high prices or uninspired atmosphere offered by some of the more traditional venues. Looking to host an event of your own? The Fine Diner Bistro provides high-quality food and service for all catered events. 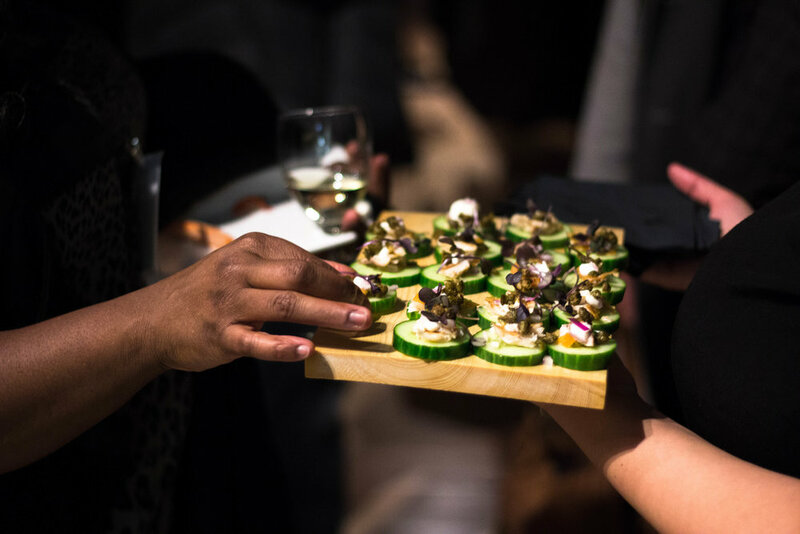 Whether in-restaurant or off-site, we have flexible catering packages to meet all of your needs. DON'T WANNA WAIT IN LINE? Good News! You can now check live wait times and add yourself to our waitlist, all through Yelp. That means you can wake up, check the wait, add yourself to the waitlist, and bike over when it's almost your turn! It's that simple! Thank you for your interest in the Fine Diner Bistro! If you are looking to make a reservation, please download the NoWait (hyperlink) app to place yourself on our waitlist. If you would like to make a reservation during the week please call us at 403.234.8885 and one of our team members will be able to assist you. For all other inquiries, our leadership team will be in touch with you within 24 hours.